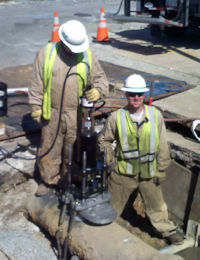 ALH System-Three Machine The ALH System-Three machine drills and taps 3", 4" or 5" NPT threads in steel or cast iron gas mains from 12" - 48" diameters at pressures up to 60 psig under Gas-Free* conditions in under 20 minutes, including set up time. The System-Three platform is also capable of inserting or extracting plugs and deploying gas bags and launching cameras. 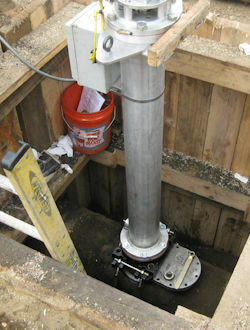 The lightweight machine is mostly constructed of modular aluminum components making it easily handled by one person with no lifting equipment, even in the deepest of excavations. 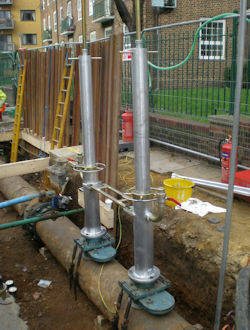 The System-Three platform attaches directly onto the main using a cast aluminum saddle to match each pipe size. 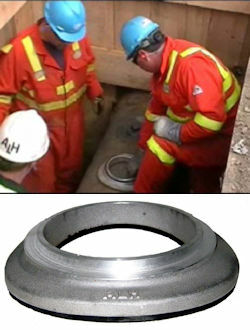 A thick rubber gasket is vulcanized to the saddle. Vulcanization produces an extraordinary bond with a very long service life. 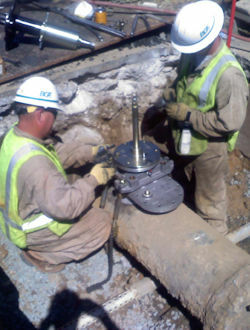 The platform is secured to the main by turnbuckle nuts on the double chain assembly, resulting in a rock steady base. 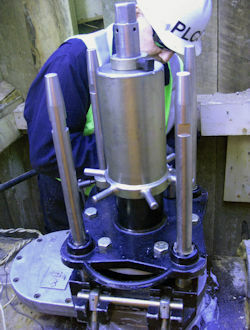 The robust drill head is bolted to the valve platform. The air motor/torque multiplier slides up and down on guide bars that counter the torque from the motor. 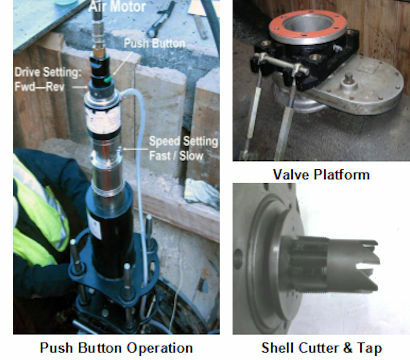 The high speed steel shell cutter and NPT tap are mounted together on the keyed drill shaft so cutting and tapping is done consecutively without removing the shaft. 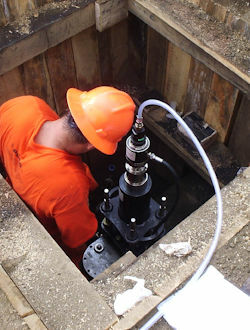 The equipment's design ensures perfect drill shaft alignment and a pilot drill is not needed. 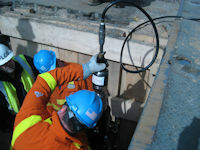 The shell cutter removes a coupon from the pipe so it cuts around 70% less metal than a twist drill. This decreases cutting times dramatically. The coupon is held inside the shell cutter and is removed from it prior to its next use. The cutter also has exceptional wear resistance and can be re-sharpened multiple times at low cost. Shavings from the cut are collected by rare-earth magnets inside the shell cutter and do not drop into the pipe. The air motor/torque multiplier has two speeds and is reversible. High Speed is used for Cutting and Low Speed for Tapping. The whole operation is push button and very easy for the operator. This lightweight, 21st century design produces fast, easy cuts with superior threads over and over again.